Home / Anti-Bullying Act / classroom bullying / Culture / Family / Republic Act 10627 / school bullying / Society / School Bullying Should STOP: And The Time Is NOW! School Bullying Should STOP: And The Time Is NOW! Being a transfer student when I was in grade school, I had been bullied by a handful of classmates and dealt with verbal insults and name-callings for quite a while before I learned how to talk back. But the whole experience, being just a kid was so traumatic that there were days I can't sleep properly, I don’t want to go to school anymore for the fear of being incessantly confronted by the bullies and rather pleaded to go back to my original school. I was so scared but I did not inform my parents about it because they might just shrug it off,or worse scold me for being a weakling. So when I was in high school, I promised myself that I’ll never let anyone bully me, ever! And instead, I became a subtle one. I made fun of some of my classmates' meekness and somehow was mean to others. I remember the time my class adviser talked to me in private because I made a classmate cry (the mere fact that he is a man and even bigger than me) . Looking back, it is something that I am never proud of. We've heard hundreds of news about kids and teens being bullied to the extent that the victims committed suicide as an escape. 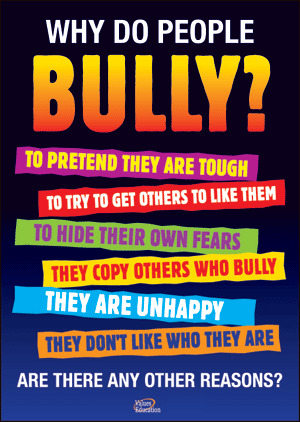 Classroom and school bullying is real, it is everywhere.... and it is alarming! It has a detrimental impact psychologically and often can cause a lifetime scar. Bullying is a rampant, widespread and under reported safety problem in school campuses. It consists of two parties: the victim (a weaker child being the subject of the bullying acts) and the bully, a bigger, stronger kid/group of kids that exercise the verbal insults or repeated harmful acts. There are instances when teachers are reported as the culprits where there is a constant insult in front of the class, physical abuse and even sexual harassment. In the Philippines alone, as of July 28, 2014 DepEd (Department of Education) after the Republic Act 10627, the Anti-Bullying Act, was passed last year, it has been reported that there were more than 1,700 cases of child abuse and bullying in the school year of 2013-2014. Those were documented cases, how about those that were not reported? 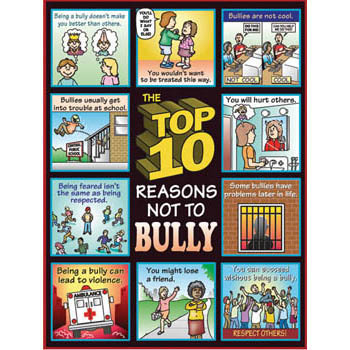 Bullying is a learned behavior and usually starts at home. And since it is a learned behavior, it can be unlearned. The common reason for bullying is when kids mimic it through their parents who are always angry, bullies and do not know how to handle conflicts effectively. They are subject of bullying by an older brother, sister, a cousin or a neighbor (mostly older than them). It can also be because they lack of attention from parents or teachers so they draw power, popularity and strength by bullying. They get their way by inflicting harm through pushing and physically abusing other kids and throwing verbal abuse and name-calling their peers. They think it is cool to be feared. Constant exposure to aggravation and violence (like what they see in movies, TV and violent video games). Research will show that it takes years before one can move on with the victimization and often times it can lead to uncontrollable emotions or can be the reason for permanent anxiety and insecurity and the devaluation of oneself which will definitely cause one to be withdrawn socially. In order to stop school bullying, it requires a three-way joint effort between students, parents, and the school administration. To be empowered in order to freely communicate and report the bullying incidents and to have the authorities properly address the matter immediately and that corresponding actions will be implemented. Student programs and awareness initiatives where students can actively participate against bullying is encouraged. The goal is to actively participate against school bullying in order to safeguard their kids from being victims of these delinquent misdemeanors or for their kids not to bully other kids. There should be a clear intolerance of bullying at home. 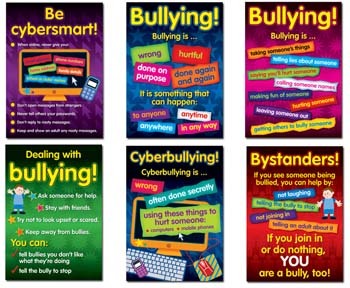 Parents should be responsible with their actions too so the children will not be inspired to start bullying. Be involved with your kids by providing attention and time to communicate with them. Let them feel that you do care so that they are assured that they can easily talk to you if there’s something that bothers them. To implement a stricter security and effective commitment not just to lessen but to completely wipe out school bullying within the entire school premise. They should be aware that most of the incidents happen with less or no adult-supervised premises like the school yards, cafeteria, comfort rooms, and hallways. Classroom bullying can be eradicated through classroom management techniques an adviser or a teacher can implement just to steer from possible cases. It takes a responsible adult supervision to stop classroom bullying and other school–violence incidents.It should start at home. It is best to instill to our young ones that it is never cool to hurt other kids. Instead, teach them to be kind and generous, gentle and forgiving, loving and respectful and to condone violence especially hurting others (verbally and physically). Core values of our children speak volumes of how we do at home. Encourage and educate them at an early age to always be respectful to one's culture, gender, upbringing, race, religious beliefs, physical anomalies, and weaknesses so it will never cross their minds to practice bullying and the need to be more powerful and superior than the rest of their peers. And lastly, be a good example as well in order for them not to be encouraged to hurt other people. Practice what you preach!